Description : I think Luna Lovegood is one of JK's best characters. She's so interesting and quirky and unpredictable. I love how you do Luna. She's exactly as I imagine her. Your stuff just gets better and better. My only problem I have with your version of Luna is that theose lines under her eyes mayke her look kind of sick and emaciated. She's just got big eyes, IMO... with a kind of crazy look in them. :p Otherwsie, that's how I picture her. That picture is just perfect. Excellent job! Luna! I love her so much. She's such a fascinating and wonderful character! You caught her character beautifully! Well done! I quite like the way you draw Luna. She's always been a favourite of mine. So cute, quirky and odd. 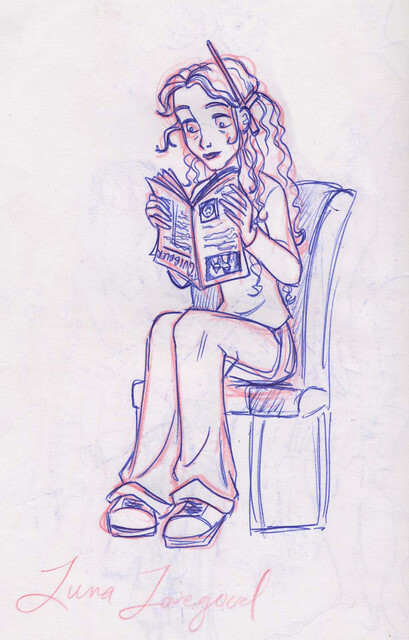 I always imagine Luna wearing a really strange, flowing dress or skirt on the Horgwarts Express instead of jeans. But does JKR ever specify what she's wearing at the time? Well, in the book it describes her hair as waist length and wavy, I think Drew was trying to portray that here. me and her relate quite a bit. LOL!! How is it that every picture you have drawn is like stepping into my imagination? ooohhhh......just like I imagined him!!!! Exactly how I pictured her except I thought she'd have straight hair. Amazing picture. I will repeat: Well, in the book it describes her hair as waist length and wavy, I think Drew was trying to portray that here.